If you’re out and about in Melbourne you’ve probably been touched by the ambition and grace of Em Gayfer in one sense or another; chances are you’ll recognise them foremost as the vocalist for the fearless Chelsea Bleach, but they’ve put their hand to their fair share of grassroots activism too. This brings us to Rock 4 Renewables, a micro-activism festival to push for renewable energy in Victoria. 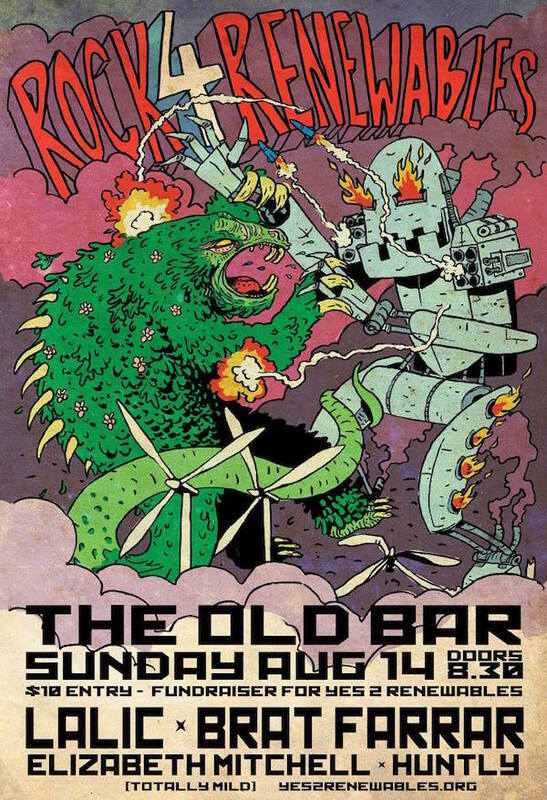 Far be it from me to explain the whole thing – instead, I spoke to Em recently about R4R’s upcoming gig at The Old Bar on 14 August. What can you tell us about Rock 4 Renewables? Rock 4 Renewables is a fundraiser event to raise money for Yes2Renewables – a Friends of the Earth collective. The group has been campaigning in Victoria for over four years to ensure legislation around renewable energy is fair in the state. We’ve been able to get the Daniel Andrews government to commit to repealing the worst of the state’s anti-wind farm laws, as well as commit to a Victorian Renewable Energy Target! After some major wins, however, this grassroots organisation is running low on funds. We’re calling for Melbourne’s rock n roll community to support us in raising some much needed money so that we can keep working in Victoria to secure a 100% renewable future for the state! The gig will feature some of Melbourne’s great musical talent, including Huntly, Elizabeth Mitchell (Totally Mild), Brat Farrar and Lalic. We’ll also have a raffle with some amazing prizes going on the night. I’ve been volunteering with Yes2Renwables for over two years. This event will be the second Rock 4 Renewables we’ve hosted – we called on the Melbourne music community to help us out a few years ago in raising some funds, so when we were having financial troubles, it was a good first place to start. I’ve been volunteering with Yes2Renewables for over two years now and am pretty active in Melbourne’s live music scene. Combining two areas I’m really passionate about seemed like a great solution to me! What can you tell us about the artists on the bill? We’ve been lucky enough to secure an absolutely amazing lineup for the event, and just goes to show that Melbourne’s musos are ready to rally behind a great cause. We’ve got Huntly, who describe themselves as “doof you can cry to” and who recently released this amazing EP. Elizabeth Mitchell from Totally Mild will be playing a dreamy solo set, Brat Farrar will be bringing his fuzzy new wave style. Lalic will also be joining us with their experimental psych stylings. And we’ll have DJ Nature Girl playing tunes in between bands, so there will really be no reason to leave the dance-floor! The event mentions the Victorian state government undertaking “ambitious renewable energy goals”, for the uninformed, can you tell us what these entail? During Tony Abbott’s prime ministership, the renewable energy sector was dealt a harsh blow, with the national renewable energy target slashed by 20%. This meant that in Victoria, the renewable energy sector was stunted and no new projects were being built due to uncertainty over what would happen in the future. In light of this, the Yes2Renewables campaign worked hard to ensure the Daniel Andrews government committed to renewable energy in Victoria. The main way to ensure this has been through a Victorian Renewable Energy Target. Recently, the Andrews government announced two renewable energy targets for the state: 25% by 2020 and 40% by 2030 – which is a great step towards transitioning to 100% renewables! What kind of renewable energy mediums (or methods) is the state government supporting? Plans for how the VRET will be implemented are still underway so we still don’t know exactly what the state’s renewable energy sources will look like. Their plans show so far that the targets will double the amount of wind energy capacity in the state by 2020 and triple it by 2025, not only increasing the amount of renewable energy but also creating 10,000 jobs which is pretty awesome. Victoria’s renewable energy targets are an important step in ensuring a clean energy future for Australia, but there are still a number of other steps to take. The VRET has set a strong baseline for Victoria, but across the country we need to see renewables growing. As well as this, across Victoria, communities have been calling for a permanent ban on unconventional gas (fracking) and are currently awaiting a decision from Resources Minister Wade Noonan, so there are still a number of other environmental threats outside of just increasing the amount of renewable energy in the state that need to be addressed.